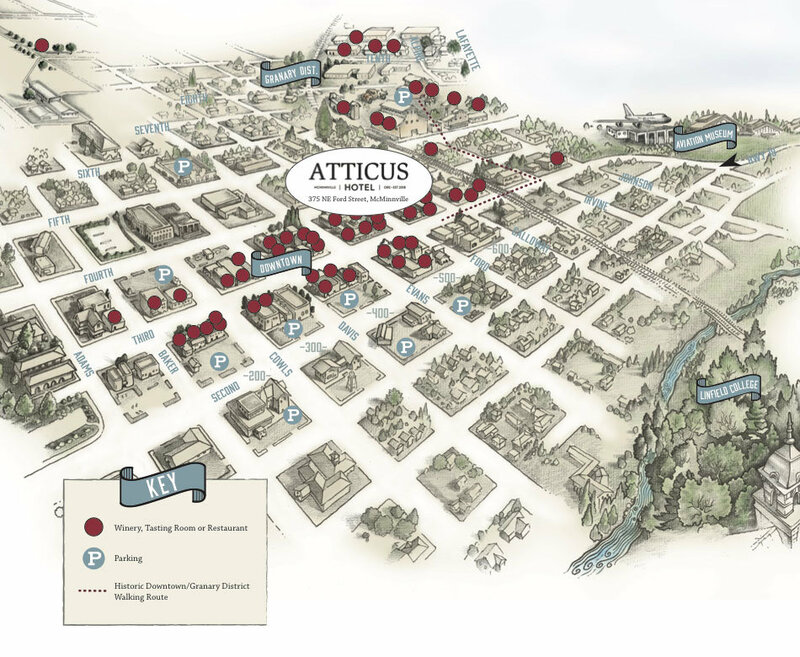 The Atticus Hotel has grown from the roots of our community in McMinnville, Oregon. 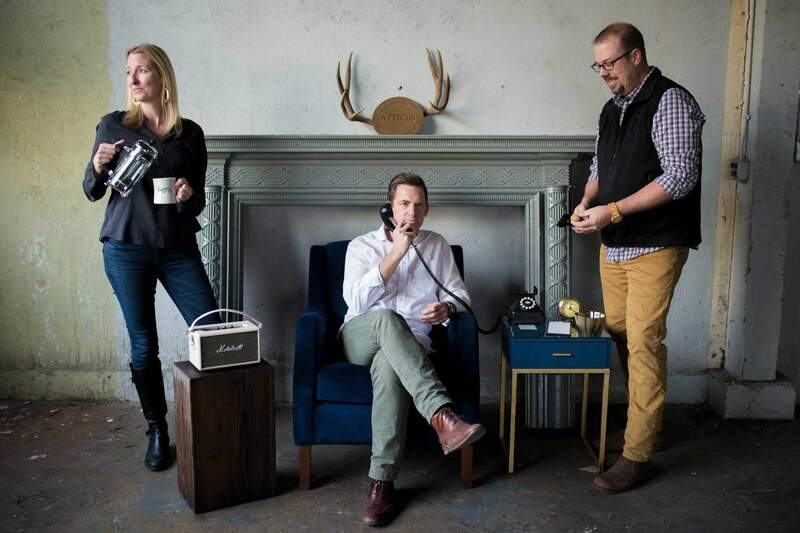 Partners Erin Stephenson & Brian Shea started chasing the dream of creating a small, independently owned and operated luxury hotel in their hometown with the launch of a boutique lodging company in 2010. Their first brand, 3rd Street Flats—a fusion lodging concept blending the best aspects of hotels, B&Bs and vacation rentals—won rave reviews from guests out of the gate, and now has two locations in Historic Downtown McMinnville. The success of 3rd Street Flats gave Erin & Brian the confidence to turn their attention full-time to bringing their long-held hotel dream to life. Armed with a vision for a luxury hotel with an independent vibe, locavore sensibilities, high design aesthetics and a level of service reflective of the spirit of generosity that flows through their community, they set to work to create the Atticus Hotel. Fueled by a passion for their community and a desire to help guests feel an authentic connection to McMinnville, Erin & Brian flipped the lens on the hotel experience, re-thinking common tropes and expectations. After seven years of listening to all the things their guests loved about 3rd Street Flats, they felt uniquely poised to bring all the best aspects of their current brand into the Atticus, creating a new twist on a luxury lifestyle hotel. As a part of that journey, Erin & Brian expanded their team to bring on long time friend and advisor Ben Perle as partner and General Manager of the hotel, helping them execute their collective vision. Ben’s long career in hospitality has given him the chance to take the helm at properties in his native France as well as Oregon–where he’s lived for the last twenty years–leading some of the state’s top luxury hotels, and bringing years of experience to the operation of the Atticus Hotel. Opening in the spring of 2018, the Atticus Hotel tells the story of what it is to be a part of Oregon Wine Country. With a location in the heart of one of Oregon’s most iconic historic towns, an emphasis on featuring local artisans, and a deep seeded knowledge that true luxury is defined by the intent behind every decision, guests at the Atticus Hotel enjoy the best of a wine country lifestyle. Erin, Brian & Ben wouldn’t have it any other way. Erin Stephenson is a McMinnville, Oregon native whose passion for travel is eclipsed only by a love for her hometown. After growing up in McMinnville, Erin headed south to the University of Oregon where she earned degrees in History and English. Her college years were punctuated with international adventures that eventually gave way to extended travels in Europe after she earned her degree in 2001. She returned home to McMinnville dreaming of opening a small hotel some day, but focusing her career in the nonprofit sector. After serving as an Americorp VISTA volunteer Erin was hired as Executive Director of McMinnville Area Habitat for Humanity, a position she held for five years before taking a post managing the charitable giving programs for a local bank. While Erin loved working with local non-profits, she was still nurturing the dream of a hotel, so in 2010 she launched 3rd Street Flats, a boutique lodging company in downtown McMinnville. The company has since grown to include two locations. Erin continues to indulge her passion for nonprofit work through her role as board chair of Visit McMinnville, volunteers with Linfield College and is on the Regional Leadership Council for the Oregon Community Foundation. She was named Business Leader of the Year in 2015 by the McMinnville Area Chamber of Commerce. Erin and her husband Travis live in McMinnville with their two young sons and two obnoxious but loveable dogs. Brian Shea grew up in Salem, Oregon as a city boy with a love for the great outdoors. After earning a degree in Graphic Design from Oregon State University Brian headed south to Newport Beach, spending several years deeply immersed in California’s design culture. A chance meeting with his future wife convinced Brian that he was ready to leave big city living behind for the charms of small town life, and he set his sights northbound once again. He married a McMinnville native and moved to her hometown. After returning to Oregon, Brian shifted his career from graphic design to real estate, taking on both commercial and residential projects. His knowledge of commercial real estate, great design aesthetic and entrepreneurial nature made him the perfect fit within 3rd Street Flats. Since coming on board with the company as a co-owner in January 2011 Brian has assisted with growth to a second location and its newest project, the Atticus Hotel. He has taken a leadership role managing the commercial real estate holding company and of course graphic design. Over the past fifteen years Brian has wholeheartedly embraced life in McMinnville, and in his spare time enjoys playing the role of the gentlemen woodsman, hunting ducks and geese, and nurturing a giant garden. He lives in McMinnville with his wife Dianne, their son and daughter, and his faithful hunting companion, Remington Bell. Ben Perle spent his early years in San Francisco and Paris, nurturing a passion for slow living while embracing the cultural wonders of two of the world’s most vibrant cities. Driven by a passion for food and hospitality, Ben earned a degree in Hotel Management and then a Masters in Hospitality from Cornell University’s Paris campus. Post graduation, a fortuitous introduction while working at Disneyland Paris led Ben to take the reigns at a nascent start-up called Chateauform—a unique hotel concept catering to corporate retreats—where he helped launch the first three locations of a company that now has 53 properties world wide. The Pacific Northwest soon came calling though, and Ben moved to Bend, Oregon where he enjoyed a long tenure at Sunriver Resort, eventually serving as Director of Resort Operations. Excited to indulge his creative side, in 2008 Ben jumped at the chance to help create Bend’s first luxury hotel—The Oxford–before moving into a regional role with The Oxford’s parent company, serving as Regional VP of Operations and overseeing properties across the western United States. An avid gardener, beekeeper, cook and entertainer, Ben is now embracing a Willamette Valley lifestyle, indulging a lifelong passion for wine by getting out into the vines in Oregon wine country. A lover of both the valley and the high desert, Ben splits his time between McMinnville and Bend, where his wife Maeve and son Luka continue to make their home. The Atticus Hotel philosophy is something we live every day. We embody it with every gesture, room detail, artful amenity, recommendation and more. As the product of our environment, we are intrepid explorers, enthusiastic hosts and fiercely independent creatives. We encourage you to experience every adventure McMinnville and the Willamette Valley have on offer.